Aesthetic doctors have recommended botox and fillers for those wrinkles, but I'm against anything beyond lasers. Call me old-fashion minded, but at least not for now. Thermage and Ultherapy are other good options, but I've really low threshold of pain. I've heard these effective treatments hurt a lot, so that's totally out for me. Reduces facial fine lines and wrinkles. Gives the skin a more firm, smooth appearance. Reduces sun damage, such as brown spots. Reduces skin blotches and blends skin color. Improves pigmented and vascular conditions. At EHA Clinic, a skin analysis was done followed by a numbing cream applied on the areas to be treated and left on for about 45 mins, but the actual procedure took less than 30 mins for my face, eyes and neck. I'm not going to lie to you and say it didn't hurt. In fact, it was really painful! Then again, everyone has different degree of pain. I've zero tolerance for pain and at that moment, I was hoping the procedure would end soon. When it was all over, I let out a sigh of relief. I then asked Dr Tam if the pain is equivalent to #Thermage or #Ultherapy; I was told that the pain I was experiencing for the Mosaic Fractional CO2 Laser is surface pain, while the latter is skin-deep. What Happens After The Fractional Laser? There was a burning sensation immediately after the laser and the treated areas were red. Burning sensation wore off after about 2 - 3 hrs later. Day 2: Skin was red and rough like sandpaper due to the fine scabs formed. Although face and neck also appeared swollen, the burning sensation has already disappeared into thin air. Day 3: Scabs were more obvious as they turned darker. Skin began to itch a bit. I'd to be really careful not to scratch it. During the 1-week period, you just gotta bear with the terrible condition of your skin. It's like a snake shredding its skin, undergoing a transformation. You've to avoid the sun during this time, and slab on lots of sunscreen. My scabs took slightly more than a week before they dropped off completely. Healing time all depends on how deep your treatment is. Post 14 days, outer layer of skin is completely healed and collagen remodelling continues for up to 9 months. Results will show in about 2 months, and will last up to a year or more depending on how fast one ages. SGD 800 for face and neck (for 1st-timer) at EHA Clinic. Although result can be seen in just 1 treatment, a series of laser is needed for optimal results. It's about a month since I had my laser resurfacing treatment. I was wondering if money was well-spent since I still don't notice any significant difference. But how wrong was I! I had another skin analysis done when I return to EHA Clinic to have my facial; Hydrafacial is highly recommended a month after the laser. 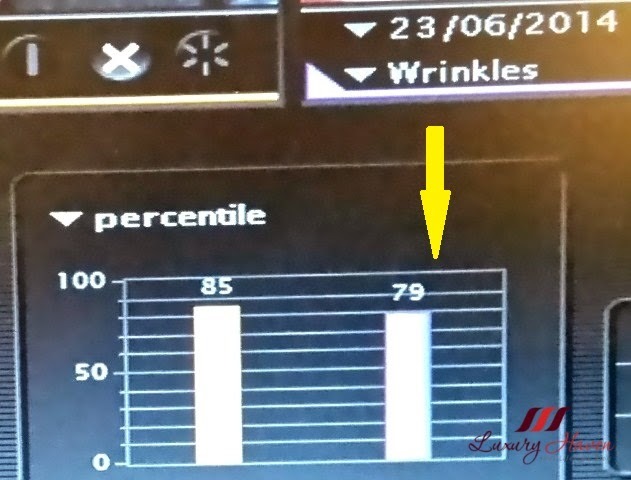 Looking at the report above, I was surprised to see the percentage of my #wrinkles actually dropped from 85% to 79% in just a month. I'm thrilled, and really looking forward to a even more flawless skin with a healthy glow in two months time! While Fractional CO2 laser can give you the most dramatic and long lasting results, the treatment requires 1-2 weeks of healing time post treatment. So if you have both time and money, it's certainly one skin resurfacing treatment to consider. 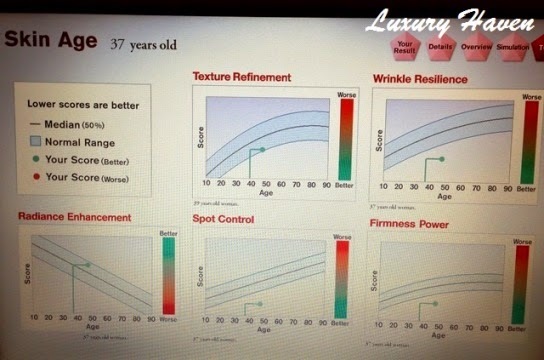 Why Dr. Tam Recommended Me The Lutronic Mosaic ECO2 Laser? Since my concern was wrinkles around the forehead and eyes, this procedure promotes collagen regeneration which is great for reducing the fine line to give me firmer and smoother skin. As I've relatively good skin, this fractional laser can help to maintain the firmness and prevent skin laxity. What Fractional Laser Is Good For Other Than Skin Tightening and Wrinkles? The laser can also be used for improving scars from acne or injury, reduce pigmentation from sun damage and improve laxity from ageing or stretch marks from pregnancy. Read more at Getting Rid of Keloid Scar with Lasers and Steroid Injection! Have you tried any Mosaic Fractional CO2 Laser or thinking of going for one? Do share with us your thoughts! You are bless and do not look like you pass 30 doll nice review. Jackie, that's really sweet of you! Thanks, dear! You have such a beautiful skin dear, you hardly need these treatment. Your skin looks so amazing that you probably don't even need this type of treatment. Rose, women are never satisfied, aren't they?? Hahaha! Kenny, thanks dear! You have a wonderful day too! I wonder what is my skin age?? Hope 10 years younger than my real age!! Haha. Almost 50 and your skin still look great! You are envy of every women, Shirley! Wish my skin would like yours when I am in my late 40s!! Rose, you can always pop by SK-II counters to check your skin age. Thanks so much for your kind words, sweetie! Shirley you have beautiful skin and look so young. Jyoti, you make me SMILE! Sharon, I guess I just have to....... since I'm allergic to wrinkles! Heehee! I've had Fraxel which is similar...and BOY does that hurt!! You look terrific!!! Liz, oh yes...... I've heard about it too! Was it worth the effort?? You are so honest to tell your age but you actually look at least 10 years younger! Thanks for your beauty tips! Veron, I'm glad my skin age is 10 yrs younger though. I'm glad you've enjoyed the post! considering your skin is already in tip top condition, now with this treatment, you are going to sparkle! DS, I do hope so! Crossing my fingers & toes. Hahaha! Nery, thanks for coming by & will visit yours soon! Never tried this treatment before but yes, why not because like you said, when one look deeper into their skin, something or rather we aren't happy about. Your complexion is showing well after the treatment. Emily, you're too modest! Yah, I was super nervous too, dear! You are 49 already!!!! Wow! I always thought that you are in your mid-30s. It's good to know for future. I have not tired laser before but I am not one to undergo pain. LL, looks like both of us have zero tolerance for pain! Hahaha! This is good to know for the future and wow... You look a lot younger than you are!! That is amazing! I wish my skin will be like yours when I am older honestly! I give you a lot of credit for keeping up with your looks. I'm a firm believer in a healthy diet, lots and lots of liquids, which Marion swears by and she has beautiful skin at 94 years young. It's also a gene thing too. I've often heard foods high in Vitamin C are collagen builders. I believe feeding your skin is the best way to keep it healthy. Louise, guess we're both lucky to be born with good skin :) I too, believe in feeding our skin but sadly, I'm not much of a water drinker. Wish I can maintain my good skin when I reach Marion's age. Lol! Btw, are you on Facebook? Here is a link for those infused water recipes I was telling you about in my other comment. Okay, firstly, not many ladies will simply inform their age like that. So, a clap to that. Hehe. But on a serious note, you really don't look like in your late 40's. SGD800? That's too much in RM wakaka. Some time ago, a girl was putting this makeup on me (we were doing a performance), and she said my skin is like a girl. I dunno whether to take that as a compliment or not cuz I'm a guy. Haha. And she said how come I don't have pimples... I told her, the secret to that is to not touch your face with your hands a lot, especially when you have pimples. :D Okay, that's enough info lol. You're really amazing, Shirley, You look very young. Thanks for sharing. Indra, thanks so much for coming by! Great having you here! I was invited to Biotherm's product launch for Men's Skin Care a few years back. The promoter did tests and cheekily told me that my face is the most oily skin they have recorded! OMG! I was stunned and speechless but she pointed out that was the reason I did not have wrinkles till now. You can call me Ko-Ko actually. Now I have started using SK-II due to your influence. My pocket has burnt a hole now but I am satisfied. Tan, wow! You must be carrying a pack of oil blotters with you all the time! True enough, I've heard of that too - dry skin tends to have more wrinkles :< So which is better? Oily skin with no wrinkles?? Hahaha! you look so young. the treatment is a bomb $800 thou I would love to try but have to consider cos of the cost.